2018 has just got started, and here at Slow Dragon Music, we’re hitting it with a big ol’ ‘one-two’ of announcements for the ninth yearly Hordes Of Belial. The first of two bands now announced for the annual Dundee event, Preston’s Solitary have unleashed no less than three albums via Copro Records, and strode across stages with Lawnmower Deth, Xentrix, and Cerebral Fix. Their most recent release, The Diseased Heart Of Society, sees the band at their most virulent, and raises the thrash bar several notches. The second of our first two bites are the no-less-powerful King Leviathan, who have taken their blackened thrash to some enviable spots; Mammothfest, Bloodstock, Thrashersaurus, Frankfest, and The Night Before Uprising. They also received Album Of The Year nominations for their Paean Heretica debut full-length, from Totally Tankered, Metal Gods TV. 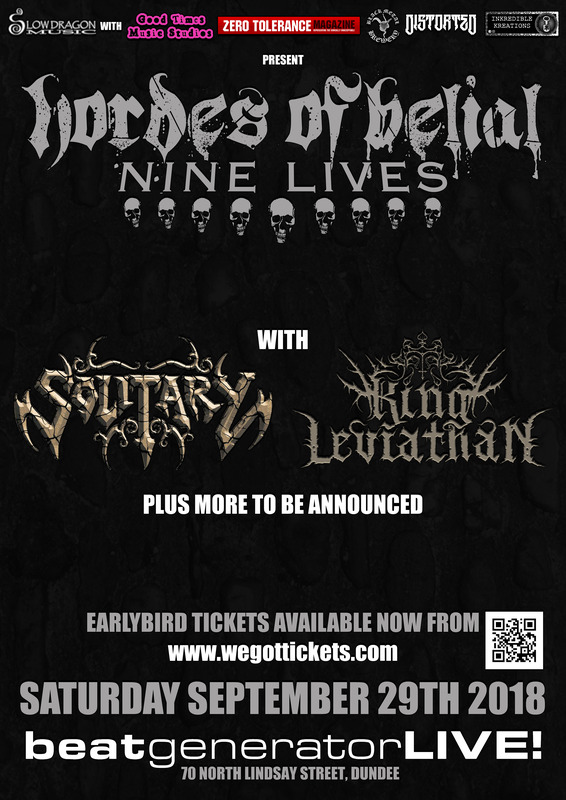 Earlybird tickets for Hordes Of Belial – Nine Lives are available until midnight January 31st 2018, and further information will be posted via the Facebook event group below. Posted in Latest News and tagged Beat Generator Live, Black Metal Brewery, Distorted, Good Times Music Studios, Hordes Of Belial, Inkredible Kreations, King Leviathan, Slow Dragon Music, Solitary, Zero Tolerance.